On the theoretically and geographically opposite end of the Gansu Province, the mountainous terrain of Xiahe provides a cool, quiet respite from both the sweltering sands and disorderly tour groups of Dunhuang. 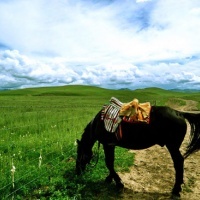 After threading through verdant grasslands grazing with yak, golden fields of wheat and undulating hills of the contiguous Qinghai-Tibetan plateau, Xiahe suddenly appears beneath the surreal blue sky like a monastic vision. Of the Gannan Tibetan Autonomous Prefecture, Xiahe is in fact no more than a simple slat-wood settlement along the Daxia River physically and socially orbiting the impressive Labuleng, mainland China's largest Tibetan monastery. Hugged up against the surrounding mountainside, the picturesque state known also as the Labrang Lamma monastery was built in 1710 and accommodates six Buddhist seminaries and over 500 monks of the Yellow Hat sect. Buddhists from across the region come to worship at Labuleng, contributing to the colorful activity that gives Xiahe its attractive allure. A three-kilometer kora (spiritual walking circuit) halos the area and is heavy with foot traffic from dawn to dusk, whereby crimson-robed monks and natively dressed Amdo pilgrims spinning hand-held mani wheels orbit the monastery while breathlessly prostrating themselves and chanting. In between turning 1,200 vibrantly painted wooden prayer wheels, the resplendently ornamented nomads rest beneath stupas to chat and sip yak butter tea, a veritable portrait of Tibetan culture. Visiting the holy capital city of Lhasa on the roof of the world may sound thrilling, but increasing occupation and rampant tourism has rapidly diluted it from the serene getaway it once was. 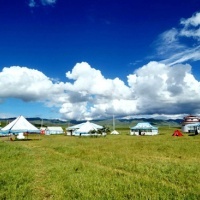 Xiahe, known as Little Lhasa, in the Gansu highlands is a more intimate, and conveniently closer, alternative for those desiring a secluded retreat of unadulterated Tibetan culture. From Langzhou to Xiahe, busses leave the North Bus Station at 7am, 8:30am and 2pm (5 hours). In Xiahe, the Tibetans have very unique festivals not like those who live in Tibet. For two years, many tourists have flocked here to take part in: Sunning Buddha Festival (13th, first month of the lunar new year), Festival of Sorcerer's Dance in a Trance (14th, first month of the lunar new year), Ghee Lamp Fair (15th, first month of the lunar new year), Prayer Meeting Festival (July and October), Tibetan Opera performances, Grassland Xianglang Festival, Horse Race Festival, Ethnic Sports Meeting, Boyu Deflower Festival, Black Water Valley Worship Holy Water Festival, Pine Shack Lantern Festival, Lotus Mountain Flower Fair, Ten Thousand People Tug-of-War, and Thrusting Arrow Festival. At the same time, the Tibetans' customs in Xiahe are very different from the Tibetans living in Tibet. They are also very attractive. Dear Pieters, our travel consultants will contact you soon, thanks for your kind inquiry.